Redux luxe: Lemaire is still refined but now more relaxed. 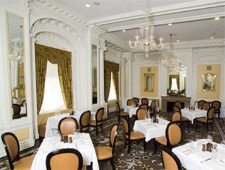 : After a trumpeted restaurant redo, The Jefferson Hotel unveiled Lemaire. Keeping the same name (an homage to Thomas Jefferson’s maître d’), it offers a contemporary centerpiece bar along with the airy, previously restored Conservatory overlooking Franklin Street. But its warren of dining rooms retains the elegance of crystal chandeliers and genteel molding befitting this venue. And though the refined décor still makes you want to sit up straight, the Southern-respecting menu is flexible and relaxed (there’s even a “create your own Manhattan” section among the cocktail, wine and beer/craft beer list). Veteran chef Walter Bundy has fashioned categories such as “cold” (Virginia-grown Asian pear and Roquefort with Surryano ham, grilled scallions and a port reduction) and “hot” (crispy Chesapeake Bay oysters with buttermilk cornbread and Jim Kite’s country ham) that can be mixed and matched into any size repast. Entrées exude comfort as much from their creativity and components (sorghum-glazed pork loin chop with grilled fennel, sweet potato purée, Brussels sprouts, pancetta and cider jus) as their prices; nothing over $30 and some below $20. A foie gras sauce-anointed “Barnyard” burger with sunny side up egg is as impressive as a burger gets. Lemaire’s “Virginia Green” certification shines through not just in a regional, seasonal consciousness, but right down to the mint in the ginger mojito hailing from The Jefferson’s own urban garden.